Karate-do is a discipline for both mind and body and benefits children and adults of all ages and body-types. Consistent practice strengthens the entire body while simultaneously encouraging the development of self-discipline and good character. In addition to being an effective and practical form of self-defense, karate is also an excellent form of exercise. It improves self-confidence, coordination, concentration and focus. 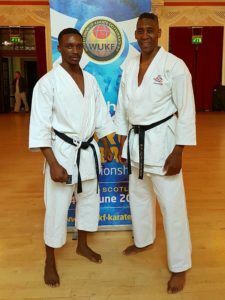 Lutho Singata (left) and Sensei George Best pictured at the 2018 WUKF World Championship in Scotland. Sensei Best (UK) is a previous World champion, 2x European champion, 3x British champion and 3x All-Styles champion. Best will be conducting seminars in South Africa in September. His Eastern Cape Seminar will take place in Makhanda and will be hosted by Rhodes Shotokan Karate Club, East Cape Shotokan-Ryu and United Shotokan-Ryu. Although participation in the sports arena is encouraged at the Rhodes University Shotokan Karate Club, emphasis is placed on traditional karate values with the development of a positive attitude and a healthy way of life being of primary importance. In essence, karate-do is a system of training which better equips the karateka to cope with the rigors and challenges of daily life. Karate is one of the most integrated and inclusive sporting/martial arts communities in Makhanda (Grahamstown). On this note, don’t be too surprised to find your lecturer or professor training alongside you. East Cape Shotokan-Ryu (ECSR) was established in 1995 and comprises Rhodes University Shotokan Karate Club as well as clubs in Makhanda (Hill Street), Port Alfred and Kenton on Sea. From a community engagement perspective ECSR has strong ties to the Joza Karate Club in Makhanda and also administers the Alicedale Karate Project. Apart from weekly classes, Rhodes Shotokan Karate Club offers biannual student gradings as well as annual training seminars conducted by senior national and international guest instructors. This year, Rhodes Shotokan Karateka can look forward to training with internationally acclaimed master instructors, Andre Bertel Sensei (Japan) and Sensei George Best (UK). Memorable experiences always include outdoor training sessions on the coast and in the mountains. In conjunction with ECSR, Rhodes University Shotokan Karate Club annually organises and hosts a number of prestigious karate championships (provincial and national). This year Rhodes Shotokan Karateka will have the opportunity to participation in USSA sanctioned championships, the UWKSA National Championships in Kyalami and the Sunshine Coast Karate Open at the prestigious Boardwalk Hotel in Port Elizabeth. Those members who are not inclined towards competitive karate are welcome to just enjoy their training, or assist as jury table judges at our various championships. 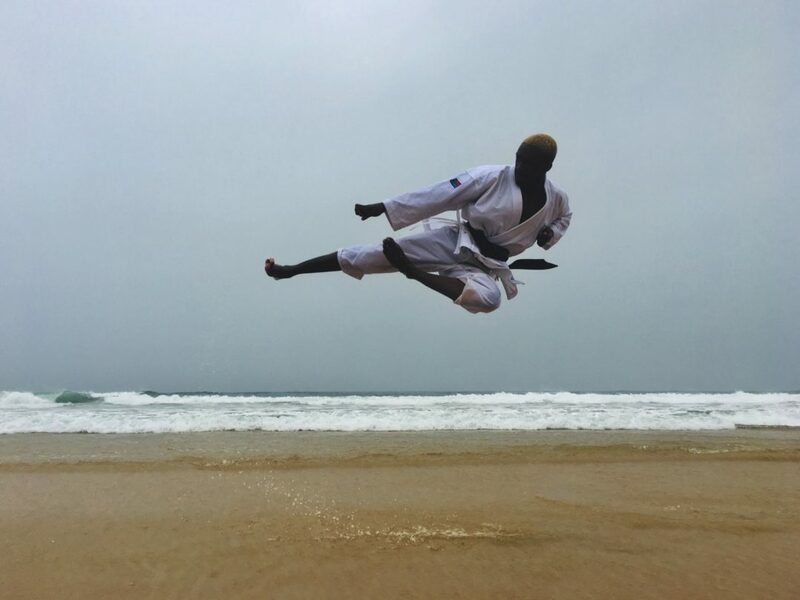 Lutho Singata: Riet River: Flying side thrust kick (tobi yoko-geri Kekomi). Our most recent international success is current Rhodes University Shotokan Karate Club head-instructor and president, Lutho Singata (2nd dan black belt) who won two bronze medals at the 2018 WUKF World Championship in Dundee, Scotland. 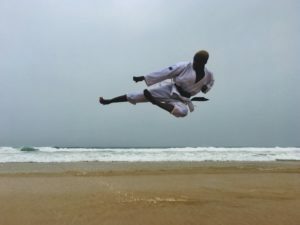 In doing so, Singata made history in becoming the first senior male South African athlete to win a medal for kumite (fighting) at the WUKF World Championships. This year he will be ably assisted with classes by Brent Smith (2nd dan black belt) and Lonwabo Sandi (1st dan black belt) – all three karateka began their training in Makhanda and are testament to the quality of karate instruction in this area. Singata and Smith will also be competing at this year’s WUKF World Championship in Slovakia. As a member club of ECSR, Rhodes Shotokan Karate Club is overseen by Gary Grapentin (6th dan black belt) who has practiced Shotokan karate for the past 34 years. Grapentin is the head instructor for ECSR. He is also the Chairperson of United Shotokan-Ryu (USR) and a member of the International Shotokan-Ryu Karate-do Shihankai (ISKS). The Rhodes Shotokan Karate Club is open to beginners, as well as novice, intermediate and more advanced karateka from other Shotokan groups and styles. As part of O-Week, all Rhodes students are invited to participate in free introductory classes which will be held at the Hangar (situated in the lane behind the Media Matrix Building) during February on the following dates: 4 (Monday), 6 (Wednesday), 11 (Monday) and 13 (Wednesday) from 18:30 to 19:30. Any comfortable exercise-type clothing is recommended with training undertaken barefoot.  For further information pertaining to Rhodes University Shotokan Karate Club, Lutho Singata may be contacted on 063 077 9768 (also on WhatsApp) or at lutholethabosingata@yahoo.com. For enquiries relating to karate classes at ECSR (Makhanda, Port Alfred or Kenton on Sea) please contact Gary Grapentin at 073 346 0059 (also on WhatsApp) or at garyg@geenet.co.za.